Take 3 capsules before bedtime with a lot of water. Take 2 capsules before bedtime with a lot of water. The best time to take the supplement is in the evening. Growth hormone release is pulsatile. 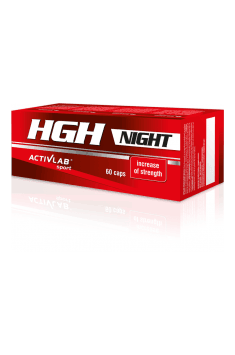 Because of that, taking the formulation at bedtime may stimulate nocturnal HGH secretion. What is more, the supplement may promote recovery and improve sleep quality. The supplement contains optimal doses of bioactive substances and that is why you should follow the manufacturer’s guidelines and not take more capsules than recommended. Blend of strong anabolic, natural substances, causes a sudden increase in testosterone levels. Testosterone booster based on natural plant sterols. It regulates the levels of testosterone and estrogen. It has mitigating effect of PMS. It positively influences the state of skin. It reduces negative symptoms of menopause. Natural dietary supplement increasing libido, rising testosterone level and limiting estrogen. GABA (gamma amino butyric acid) is an amino acid neurotransmitter fulfilling the role of suppressing, of which precursor is the glutamate (neurotransmitter) excitatory neurotransmitter. Reduces psychophysical tension and cortisol levels, enhances the synthesis of growth hormone having anti-catabolic and regenerating properties. Higher need for GABA by the organism occurs with overtraining, mental exhaustion of the body (stress, depression). Supplementation sports and for physically active people recommended after and during intense exercise. GABA is available in the form of mono-preparation supplement and multicomponent formulations to support the regeneration of the night regenerateion and relaxation of the nervous system. Dosage: 0,5-3g daily approx. 1 hour before bedtime (single dose, customarily in supplementation).